Sixty-three down, eighteen to go! This is gorgeous! If it were me, I would be quilting circles within the circles that read light. I am jealous as I would love to have this die…. but in due time, sigh! Love red and cream together. This is a beautiful quilt! This is continuing with awesome. 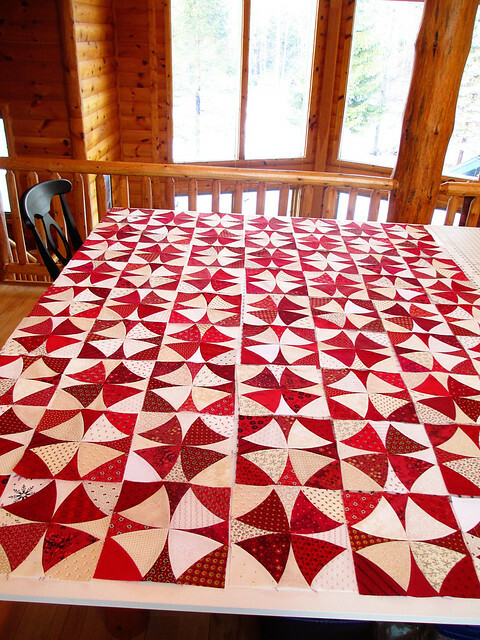 I love the quilting in the magazine — simple yet effective. It’s circles, but they look like they’re a half-inch or an inch from the piecing seams. I think it really reenforces the “circularity” of the pattern. Oh my gosh. This is gorgeous! I love the scrappy look.